MIAMI (Nov. 7, 2011) - Undefeated middleweight prospect Michael "The Brazilian Rocky" Oliveira has put next year's potential blockbuster fight in Brazil on hold against legendary Acelino "Popo" Freitas. The Brazilian-born, Miami-raised Oliveira makes his nationally televised debut Friday night (Nov. 11) on a World Championship edition of Shobox: The Next Generation, LIVE on SHOWTIME® AT 11:05 PM/ET (delayed on the West Coast) from Cohen Stadium in El Paso, Texas. The power-punching Oliveira (15-0, 12 KOs) faces cagey veteran Xavier "The X-Man" Tolliver (23-7, 15 KOs) in an eight-round bout on a card headlined by World Boxing Association ("WBA") super welterweight champion Austin "No Doubt" Trout (23-0, 13 KOs) defending his title against Frank LoPorto (15-4-2, 7 KOs). 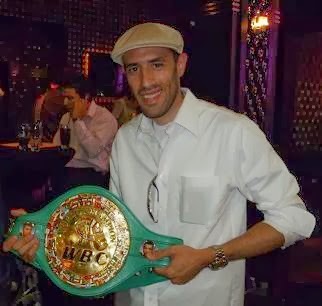 Oliveira, the reigning World Boxing Council ("WBC") South American middleweight champion, is not a typical, contemporary prizefighter. The 21-year-old with a college background comes from an affluent family and boxes not for financial gains but rather his love of the sport. Boxing has always been in his blood. His late grandfather, Joao Oliveira, was an amateur boxer who sparred a few times with Brazil's all-time greatest boxer, three-time world bantamweight and featherweight champion Eder "Golden Bantam" Jofre (72-2-4, 50 KOs/1957-1976). Michael first stepped into a gym a few years ago to lose weight and, now weighing 100-pounds less, he has successfully captured the hearts Brazilian boxing fans back home as well as those living in the United States. Four-time world champion Freitas, who Michael hopes to replace at the head of Brazilian boxing circles, has agreed to come out of a nearly five-year retirement to fight WBC #15 rated Oliveira next year in what promises to be a major event in Brazil. "I'm not distracted by the Freitas fight," Oliveira said. "I'm looking forward to fighting Freitas and then winning a world title, but each fight has to be a stepping-stone for me. All I'm thinking about right now is Friday night's fight in El Paso. I've spent a lot of time, energy and money into training and Friday night I'm finally going to get a return on my investment. I haven't prepared differently for this fight, but I'm stronger, better conditioned and improved defensively having worked so hard with my coach, Orlando Cueller. I don't feel any added pressure fighting on Showtime but I really appreciate this great opportunity." Oliveira, the two-time defending Brazilian International Press Award's Athlete of the Year (2009 and 2010), was born in Sao Paulo, Brazil but he moved two weeks after birth with his family to Miami. His last three fights have been in Brazil and his fans there will be able to watch his fight this Friday evening via TV Globo, the third-largest network in the world, which has a two-year, six-fight deal with Oliveira. "This will be Michael's toughest test to date," his father/promoter Carlos Oliveira explained. "He's stepping up, competition-wise, no doubt about that. We'd like to thank promoter Gary Shaw for putting him on this show. We're grateful to Showtime for showcasing Michael's talents for the first time on national American television." Tolliver, fighting out of Atlanta, is battle-tested having fought world champion Anthony Mundine and other top fighters such as Said Ouali, Walter Dario Matthysse and Merhav Mohar. "I was set to concentrate on fighting at 154 but this opportunity to fight as a middleweight on Showtime was too good to pass up," former super middleweight Oliveira concluded. "My goal is to eventually fight at 147, but Freitas can't fight any lower than 154, so I'll be fighting at junior middleweight after this fight. I'm still very strong but now have more effective weapons than just my power. I'm in the best condition of my career and have improved my defense a lot, but ultimately my strength will prevail above all." Go to www.MichaelOliveira.com for more information about this exciting, young fighter.